Following the anti-Monsanto activism launched by nations like France and Hungary, Poland has announced that it will launch a complete ban on growing Monsanto's genetically modified strain MON810. 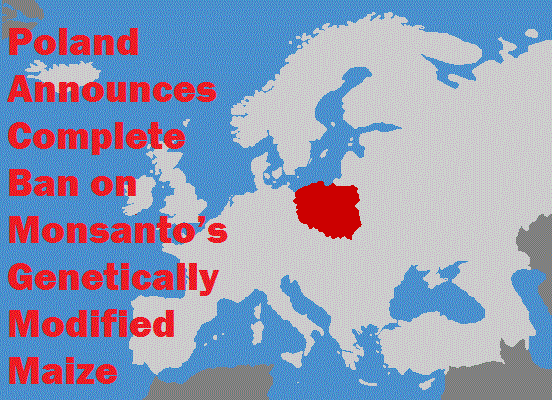 The announcement, made by Agriculture Minister Marek Sawicki, sets yet another international standard against Monsanto's genetically modified creations. In addition to being linked to a plethora health ailments, Sawicki says that the pollen originating from this GM strain may actually be devastating the already dwindling bee population. “The decree is in the works. It introduces a complete ban on the MON810 strain of maize in Poland,” Sawicki stated to the press. Similar opposition to Monsanto occurred on March 9th, when 7 European countries blocked a proposal by the Danish EU presidency which would permit the cultivation of genetically modified plants on the entire continent. It was France, who in February, lead the charge against GMOs by asking the European Commission to suspend authorization to Monsanto's genetically modified corn. What's more, the country settled a landmark case in favor of the people over Monsanto, finding the biotech giant guilty of chemical poisoning.